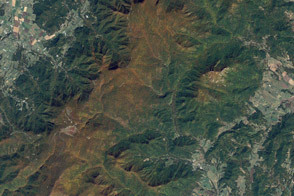 This natural-color image of Bruce Canyon National Park was obtained by the Landsat 7 satellite’s Enhanced Thematic Mapper Plus (ETM+) instrument on June 6, 2000. 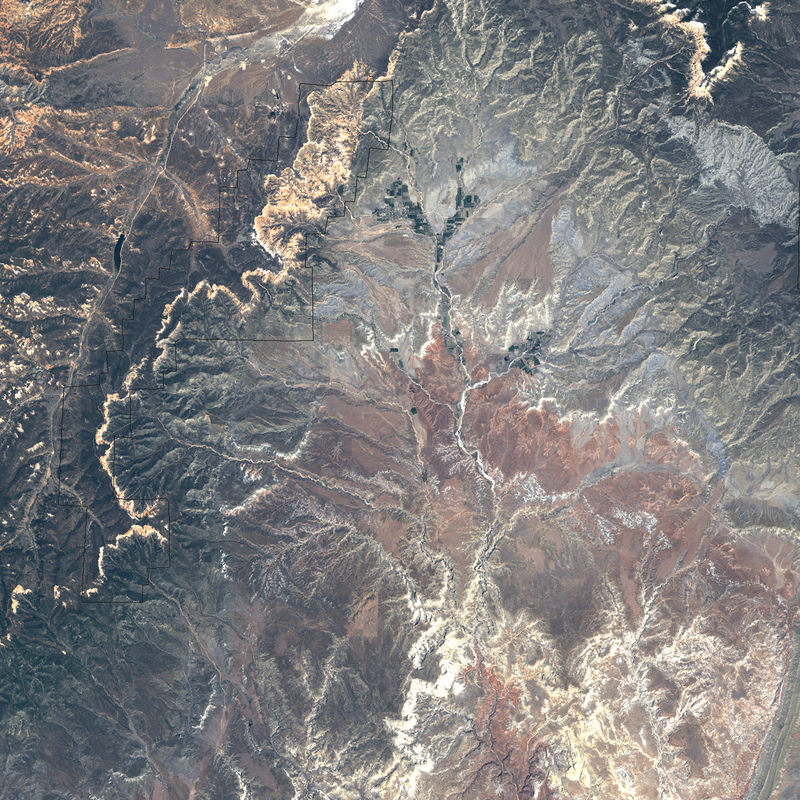 From its vantage point high above the surface of the Earth, ETM+ sees roughly the same mix of colors in the landscape as humans would see on the surface. Erosion reveals brilliant yellow and red stone. 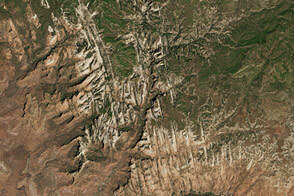 The dark grayish-green on the high plateau rim is from conifer forests, while similar green patches in rectangular grid patterns in the valley floor below the Bryce Amphitheater are agricultural fields. The Tropic Reservoir appears as a dark blue oval just outside the park. While pioneers and modern society have left obvious marks on the landscape through road building and irrigated agriculture, archaeologists believe that humans have been present in the region (especially at lower elevations) for the past 10,000 years. Paleoindians are believed to have hunted huge mammals, such as the wooly mammoth, here at the end of the Ice Age. More recently, both Pueblo and Paiute tribes have hunted game in the forests and meadows in the region. Railroads and work by the Civilian Conservation Corp in the 1930s made the area easily accessible to modern travelers. As many as 1.5 million visitors admire the park landscape in an average year. While the park attracts many visitors, it is well away from most large cities, and its high elevation and dry air give it crystal-clear skies treasured by astronomers. In 2006, the park was the setting for the sixth Annual Bryce Canyon Astronomy Festival, where park visitors were able to enjoy stunning views of the night sky through telescopes at the park. For more information, visit the Bryce Canyon National Park Website. NASA image created by Jesse Allen, Earth Observatory, using data obtained courtesy of the University of Maryland’s Global Land Cover Facility. 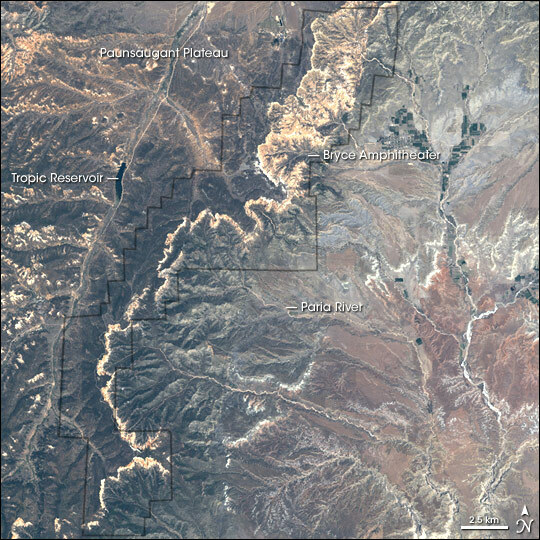 The park sits at the eastern edge of the Paunsaugant Plateau, and the ridgeline offers stunning views across southern Utah.